How do you get ready for something like this ? 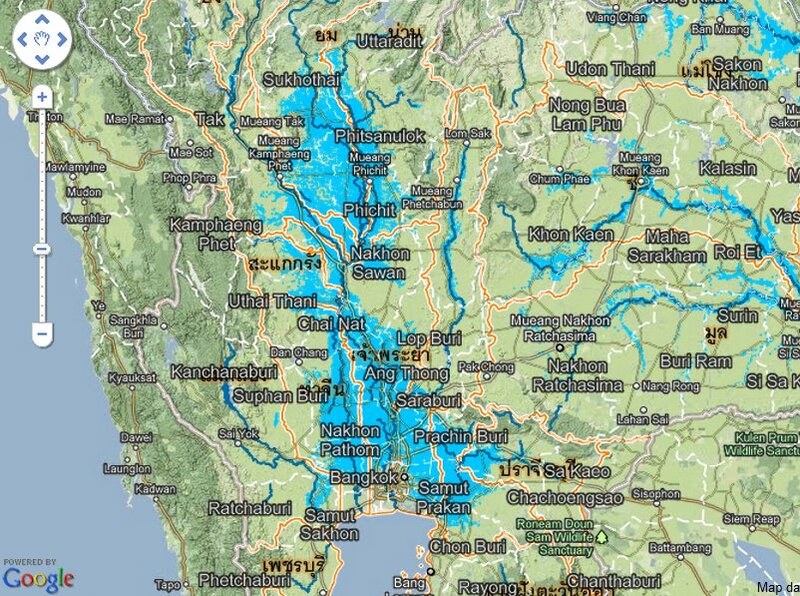 The blue area is the flood water which have to flow down into the Gulf of Thailand… and there, right in its path, is Bangkok, with dykes and walls of sand bags trying to keep the water out. It’s like a fight with a pro-WWE wrestler where you are armed with only a fork… or maybe a toothpick. So, besides watching the news updates, listening to the radio updates, waiting for the kid in the school’s parking lot 3 hours ahead of time, I’ve also been on the internet searching for even more flood updates. 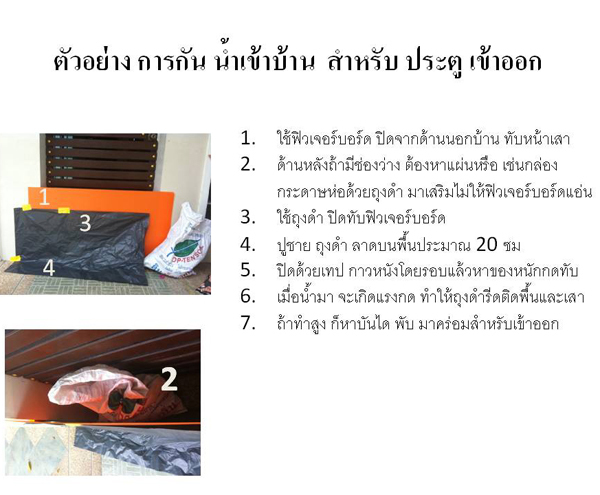 I found this Thai site where fellow flood veterans show how they protect their house from flood. Very interesting. These are metal sheets which he fitted into slots so they can be taken out when the flood subsides. The poles in the middle are for added support , and the little step stool is for getting in and out of the house. 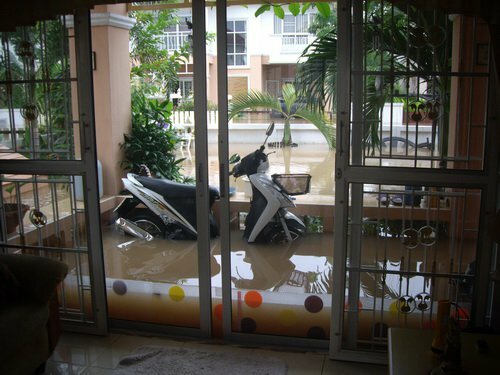 The housing estate he lives in was flooded to 60 cm, but only a minimal amount of water seeped in. That was taken care of with a submersible water plumb. He also mention that you should have some clay on hand to seal off any cracks. I think this method works, because if you look at the photos on the site, the whole housing estate seems to be sporting this defense. Now, how to water proof the inside of the house. 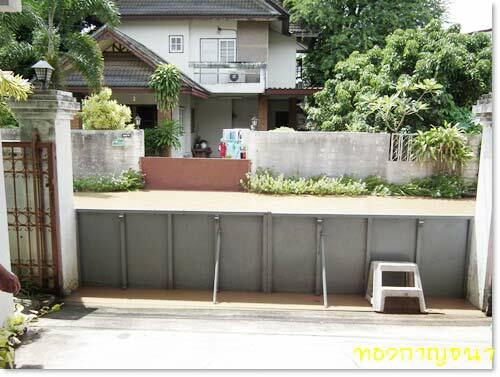 คุณสะใภ้อินเตอร์ ( Khun SaTai Inter ) have 4 years of flooding experience. He also have the metal sheet ‘flood gates’ .You should take a look at his ‘before and after’ flood photos, all very interesting. To waterproof the inside of his house, he drilled plastic sheets outside the front doors and back doors, then silicon glued the edges to waterproof them. He noted that last year he used clay to seal the front doors but it did not work. Now another method to seal of the random door around the house. It may look a bit makeshift , but I do have faith in the plastic trash bag trick. Inner city floods are sometimes caused by plastic bags covering drainage holes. Water pressure pushes the plastic bag against the wall and keeps the water out. Here, flood veteran, คุณอนันต์ ( Khun Ant ), shield the door with a plastic board. Support is placed in the gap between the board and the door. A plastic trash bag is duct taped onto the board with 20 cm trailing on the ground. Then, bricks are placed on trash bag. All you wait for next is the water to come and push the bag into place. I’ll be posting more of these flood-related post, so bear with me for a while here.